Janet Ann Knebel, 59, died on March 29, 2019, at the Dumont Wellness Center in Dumont, Iowa. Janet was born to Elmo and Irene (Bakula) Knebel on October 11, 1959, in Waterloo. She graduated from River Hills School in 1981. Janet worked at Goodwill Industries for 20 years. 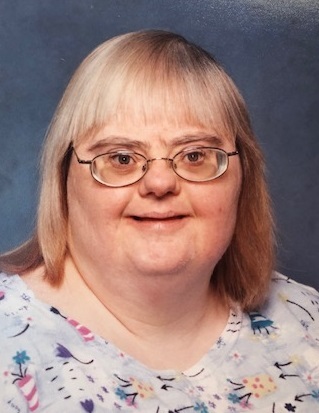 She enjoyed many friendships from her time with Exceptional Persons, Inc., Cedar Valley Community Support Services, Dumont Wellness Center, North Star, Goodwill, and Newell Post. Janet enjoyed crossword puzzles, magic shows, gospel music, church day camp, bingo, going out to eat, Elvis, the Iowa Hawkeyes, and dressing up to go to church. She also participated in the Special Olympics and the Aspire Horseback program. Janet is survived by a sister, Julie Claussen of Waterloo; a brother, Bill Knebel of Dunkerton; and many more loving family members. She was preceded in death by her parents; two brothers, Edward and Jerry; and a sister, Joan Miller. Please direct memorial to Cedar Valley Hospice. The burial will be on Saturday, April 6, 2019, at 10:00 AM, at Barkley Cemetery in Dunkerton.